Der Artikel Wolfgang Amadeus Mozart (1756-1791): Klaviertrios Nr.2,3,5 (KV 502,542,564) wurde in den Warenkorb gelegt. The piano trio had thrived as a genre suited to amateur music-making in eighteenth-century parlours, but it was only when Wolfgang Amadeus Mozart turned his hand to the medium that it was transformed into the ‘art form’ we know today. Emerging from the home into the concert hall, piano parts became significantly taxing (Mozart wrote them for himself to play) and the violin and cello were elevated from accompanying roles to positions of equal prominence. 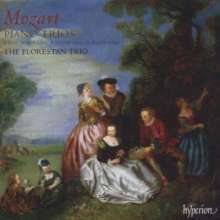 The three trios on this disc were written at the zenith of Mozart’s powers, K502 in 1786, K542 and K564 in the second half of 1788. 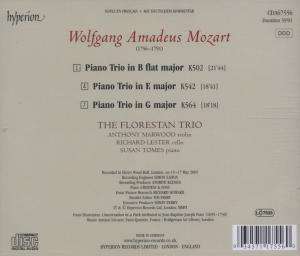 All three are masterpieces, a sense of profound musical thought ever-present beneath their tranquil exteriors. Performances by The Florestan Trio are every bit as committed and polished as we have come to expect from their many previous acclaimed recordings.